the fancy teacup: the pony express. It's been a long time waiting since I've found a pony print dress that I've really liked. So after what seemed like the typical timeframe to receive a message before the telegraph was invented, this wild breed of a gem made an appearance. When I got dolled up in, it was like receiving unexpected mail that have been postmarked ten days ago while en route on the pony express. The wait was worth it. I am afraid that my other clothes may be left in a cloud of dust as I gallop off with this dress. This little pinafore is definitely something that conjures up the spirits of horseback couriers from the old wild, wild west. I am In love with your dress! I love the horse pattern on the dress and the boots. Horse patterned clothing are really popular for some reason. I love the things you write in each of your posts. They are so unique and make a regular fashion blog new and interesting. I also love your dress! So cute! I love that dress on you! Loved the tittle, totally defines the western print! The bracelets are adorable! your dress is absolutely gorgeous, such a lovely print! Adorable ~ super sweet outfit I <3 it ! Das Kleid ist so umwerfend, Liebe Grüße! And for me, you can't beat a little black cardigan, it goes with everything! The dress is adorable! Love this outfit!! 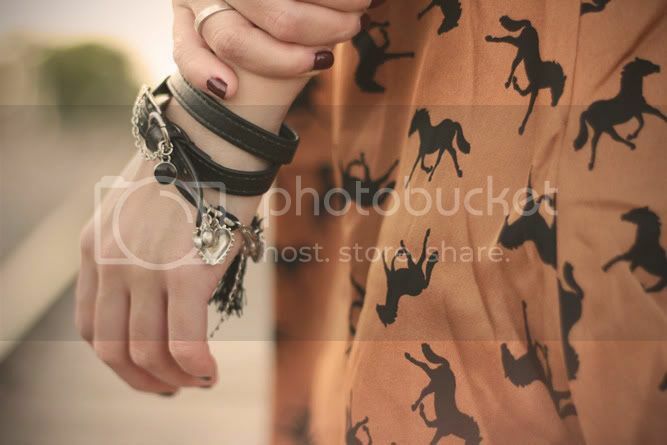 that horse print dress is simply adorable! and i love your boots. Love the dress, the print is so cute! love love love that dress! wow! this dress is adotable! i like the background!! and the accessorize!! u have a great taste! Love your outfit, looove your pony dress, soo cute!! 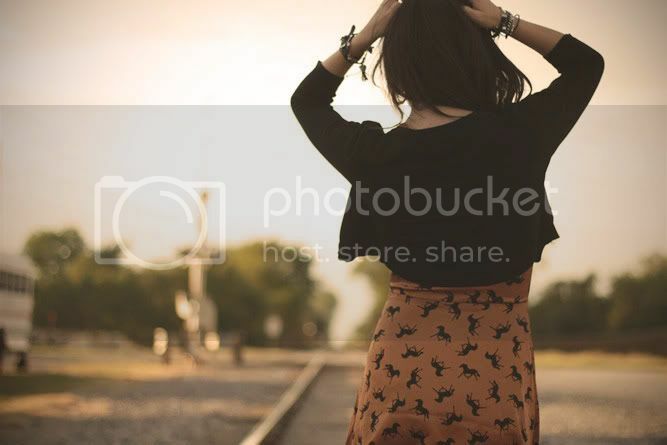 Love the dress, and love the detail of the pics on the train tracks!!! Great talent! Head to toe this outfit is fabulous - love the boots! This outfit is beautiful! I love that dress! So cute! youre so cute!! i love the pattern on your dress! wow those seem like some very cute and comfortable boots! oh my gosh i want that dress so badly! you look wonderful and i like the backdrop too! Come and visit me too! Lovin' your horse print dress and I got the Topshop boots that kinda look like your Zara boots and I've been living in them!!! LOVE LOVE LOVE your styling! U look fantastic babe! happy friday! You look adorable in this dress! Love the horse print! Call me M @ Do You Speak Gossip? You look stunning ! Love your dress and shoes ! The print on your dress is beautiful! So lovely with the rusty background colour. These rustic brown and black color ways look great on you. Adorable print on this dress. love your dress! and great pics! You are very elegant. I like those pictures. That horse print dress is awesome and looks great on you! I love the fall color of it too. the cutest pony dress ever!! love it and i want it! love the outfit thanks for all of the inspiration. i hope you can stop by sometime! I love your dress!!! Very original! Fell in love right away! The horse print dress is so fresh and unique. i'm loving these boots. but my favorite thing is that awesome unique print on your dress. Some people are too smart to be confined to the classroom walls! Here's a look at other famous school/college dropouts. I really love your dress! I'm WILD about your booties! wow your an amazing blogger! Great dress & boots !! I really love this look ! Nice and iteresting post! good! have you seen my new post outfit? ther is also a fabulous giveaway, with non limit price! come to partecipe! i wait for you! lovely blog! been following you for a while but first time i leave a message:) hello from new york! I love those boots, so chic! they look comfy too :) gorgeous look jamie! Love the dress! You always look amazing in prints. Great outfit. Dear, you look amazing yet again! I don't know how you do it! That horse dress is so precious and really looks great in combination with those booties. wowwww amazing outfit!!!! im in love with your blog!! Just discovered your blog and totally loved it!! Also I see you have similar hooded eyes like I do, what can you recommend about make up? You've got such a great collection of shoes! I so love it!!! come to visit my blog, can we follow each other? Cute print on that dress! This is amazing! I love to follow your posts you're an inspiration! Check out at my new outfit post! love your cute dress! and I looove your boots! Very nice your dress! If you want you can come in my blog http://thinkingincoffeebreak.blogspot.com/ :) and follow me! This print is just adorable, dear!! Love it. Great photos today and a lovely outfit as usual. I love so much this dress! Ps: Want to follow each other? The print is so perfect. beautiful !! !amazing blog! !i'm following you!! if you like mine, do the same!!! Love the pony dress.. how cute! So cute! I just did a post about cat prints, but I love the ponies too! Hi! I just found your blog and I think it's really cute! Love your style! You might like my blog too as it's a personal style and fashion blog from me over here in England. I would love for you to stop by and comment if you like it! I like your dress with the little horses. Stunning! 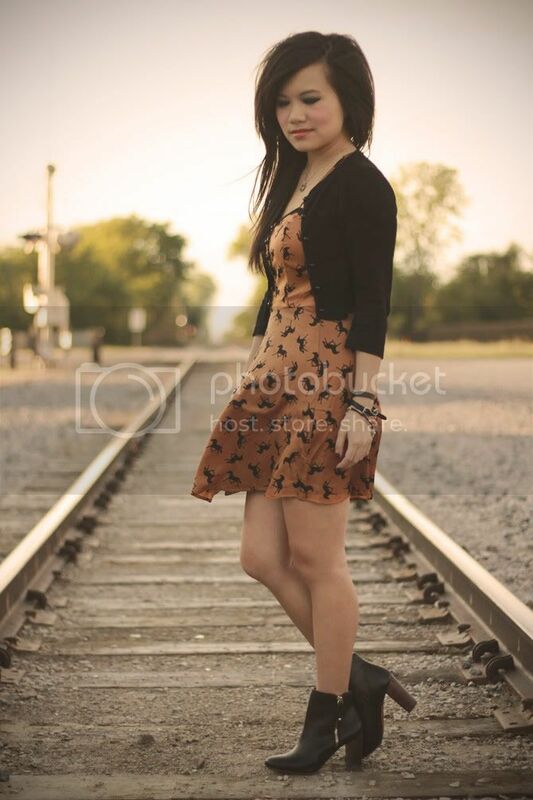 This dress is seriously so perfect for fall. I adore the colors of it! This is so pretty! The dress and the pictures are amazing! I'm so in love with this dress!! Dress in amazing on you! Imagine the bottled up ideas of a fashion and art inspired damsel, who translates outfits and photography into self-designed editorials for a worldwide audience. The original "editorial/magazine layout" designed style blog. All original editorial/magazine layout designed concepts and formats, creative design, graphics, photos, artwork and written content are the sole property of www.TheFancyTeacup.com and The Fancy Teacup™ and cannot be copied, duplicated, or re-published. © 2010-2014 The Fancy Teacup™ All rights reserved. Subscribe to The Fancy Teacup! Follow me on Instagram @jamiefleck! ALL ORIGINAL EDITORIAL/MAGAZINE LAYOUT DESIGNED CONCEPTS AND FORMATS, CREATIVE DESIGN, GRAPHICS, PHOTOS, ARTWORK, AND WRITTEN CONTENT ARE PROPERTY OF WWW.THEFANCYTEACUP.COM AND THE FANCY TEACUP™ AND CANNOT BE RE-PUBLISHED WITHOUT THE CONSENT OF WWW.THEFANCYTEACUP.COM AND THE FANCY TEACUP™. 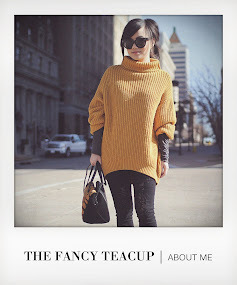 © 2010-2014 WWW.THEFANCYTEACUP.COM. AND THE FANCY TEACUP™. ALL RIGHTS RESERVED.